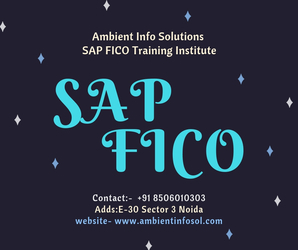 SAP FICO Training Center Ambient info Solutions in Noida one of the best SAP FICO Training Classes in Noida. SAP FICO is the Finance and Cost controlling module in SAP ERP where FI stands for Financial Accounting and CO stands for Controlling. SAP FICO module is very robust and covers almost all business process encountered in various industries. It is one of the very important and widely implemented modules in SAP. Ambient one of the best training institute in Noida, Delhi NCR. Ambient trainer is 15 years experience in SAP FICOTraining Classes in Noida.